Convicted former First Lady and incumbent Ilocos Norte Rep. Imelda Romualdez Marcos still managed to use her old congressional protocol plates despite a recent recall order issued by the House leadership. 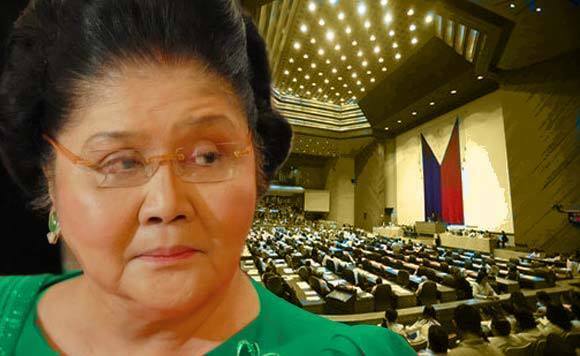 Various television footages on Friday showed that Mrs. Marcos’ Toyota Coaster mini-bus was still bearing the “no. 8” protocol plate while she was about to board the vehicle after being allowed by the anti-graft court post a P150,000 bail bond following her graft conviction last week. The protocol plate attached on Marcos’ mini-bus was most likely not issued during the 16th Congress since it bears the tagline “Matatag na Republika” (Strong Republic)—the trademark of vehicle plates during the Arroyo Administration. The Land Transportation Office (LTO) continued to issue the said Strong Republic edition of vehicle plates until 2014. The former First Lady was first elected as Ilocos Norte solon in 2010. Aside from the mini-bus of Mrs. Marcos, the Ilocos Norte solon’s back-up vehicle—a black Toyota Land Cruiser also bears a white congressional protocol plate—indicating that it was issued during the 16th Congress. On Wednesday, the House leadership ordered the recall of all protocol plates issued to legislators and their staff during the previous Congresses—specifically the 16th Congress edition in the light of road rage incident in Angeles City, Pampanga last week. Andaya said no less than former President and now House Speaker Gloria Macapagal Arroyo gave the instruction for the immediate recall of all protocol plates issued during past Congresses, particularly the 16th Congress after receiving reports that certain vehicles with such plates have been spotted in indecent places or figured in crime-related activities. Two dash footages recently went viral online after a green Toyota FJ Cruises bearing a congressional protocol plate engaged in separate road rage incidents in Pampanga and Quezon City respectively. The incidents had been initially blamed on the son of Pampanga Rep. Carmelo “Jonjon” Lazatin II after the FJ Cruiser driver who was allegedly caught on cam introducing himself as the legislator’s offspring. Authorities later dismissed the involvement of the Lazatins following the arrest of musician Jojo Valerio who they claimed was the real person who punched a motorist along McArthur Highway in Angeles City.